I was a fit, clean living guy with a successful career in I.T. when at 55 I had a near-fatal heart attack whilst running on the beach one morning. Six months later I was out cycling and got hit by a car. Three months in hospital followed. On reflection, I could have paid more attention to earlier warnings. I’d been mis-diagnosed with muscular dystrophy a few years earlier and been very sick for a long time. My organs were showing signs of stress – digestion, brain, kidneys, heart, lungs. I’d become more and more pressured and withdrawn at work, losing the passion I’d always had. Stress, anxiety, sickness and insomnia had become my companions. The critic in my head roared at my diminished capacity. I started to drown my misery in booze, then recovered to launch a mid-life crisis triathlon binge. I’m a very determined character, so I ploughed on, heedless of the toll it was taking. Flashback to a decade earlier when I was already searching for ways to restore my health and downtrodden spirit. I immersed myself in meditation retreats. I qualified in NLP and Reiki. Then I studied heart health, gut health, mind health, Kinesiology and coaching. I was quietly trying to piece together a rescue package. Finally I came across Brooke Castillo’s The Life Coach School and suddenly the solution opened up before me. I learned how to manage my mind and emotions in order to live an amazingly fulfilling life. The techniques were so simple – but they made sense to me in a way nothing else ever had. This was the missing link. My spirit quickly revived and I began to flourish again and today I’m back on deck, enjoying life more than I ever have, doing what I love. 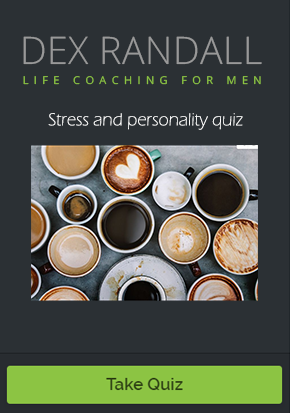 Now in my coaching business I work with men who, like me, tend towards high stress and anxiety – high achievers, competitive, aggressive, impatient, perfectionist. Men who may not develop warm and supportive relationships easily. Exhausted men who can’t find joy in life. Men in existential crisis. I help them re-connect to their power, joy and purpose. Chronic stress is very damaging to humans and I don’t want anyone going that way. Much less you. My mission is to serve anyone who still suffers like I did. Book an online mini session to talk about your problem and discover how to immediately feel better. As a certified coach, I understand the range of skills that are critical for success. 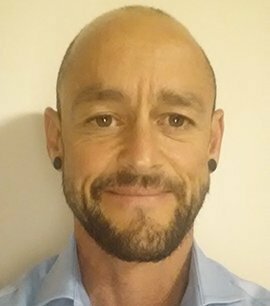 I chose Dex to coach me because he combines a powerful coaching model with his innate genius and ‘sense’ for the specific needs of his client. Dex helped me make significant breakthroughs across a variety of issues I‘d been struggling with for some time. He’s fun and engaging, but knows how to cut thru the noise and get the root cause of an issue. And then he knows exactly how to help rebuild for better results, from the ground up. Dex has this incredible ability to know where the blockages are and what is in the way. I learn huge amounts about myself from a session with Dex. He is someone I highly recommend. Working with Dex I’ve changed my beliefs around sleep, and am now getting quality sleep and waking up with more energy. I can handle difficult situations to decrease stress and increase positive results. I have more confidence in my life and am a more effective and compassionate mother and wife. I’m confident you’ll receive invaluable non-judgmental coaching working with Dex.